You'll be £15.00 closer to your next £10.00 credit when you purchase Blockade. What's this? The Royal Navy’s role during WWI in denying Germany access to the sea, trade and vital resources was crucial in helping win the war on the Western Front; the ‘Northern Blockade’, located across the inhospitable waters between Iceland and Scotland, was to bring the German economy to its knees and destroy her home front morale. Likewise, the Royal Navy’s success in negating Germany’s attacks on British commerce prevented much suffering in Britain, and the author vividly describes the final destruction of German surface vessel commerce warfare, culminating in the hard-fought battle between the raider SMS Leopard and two British warships. The American reaction to the British naval blockade and to Germany’s war on trade and her treatment of American sailors taken prisoner is looked at, while the changes in strategy on both sides through the war and the use of converted liners and armed merchant vessels as warships (AMCs) are examined in detail. Accurately described as ‘fast paced’, Dunn is an engaging writer with a flair for the dramatic that will appeal to a wide readership. This is more than usually important, as Blockade is aimed at the general reader with an interest in the subject, rather than being an academic text. This is the fascinating story of the Northern Patrol and the sea blockade of German; of the men and ships of the 10th Cruiser Squadron. After the war, the German government estimated that the British blockade had killed an estimated 750,000 people. Grand Fleet Commander Admiral Beatty hailed it as a 'great passive victory' for the RN. It is a victory excellently recounted by Dunn in Blockade. This book serves as an excellent introduction into the details of the blockade; its history, evolution and effect. It touches upon themes that should be discussed in more detail such as the morality and legality of the blockade and the stigma of German attempts at unrestricted warfare; however, these are not pursued in any real analytical depth. Dunn’s work is solid and very readable and is recommended for those seeking to gain insight into the nature of this kind of warfare and its impact upon the Allied war effort in 1914-1918. In Blockade Dunn provides a vivid account of the 'war by starvation' (as the Germans called in) that showed Britain's navy was not averse to ruthless tactics to deny the enemy food and war supplies. Nonetheless, Dunn points out that there were still moments of chivalry and honour even in such a relentless campaign. After four books on the First World War in quick succession, we look forward with great eagerness to see where Steve R. Dunn takes us next. Overall, a well-written and necessary book, one of import for casual readers and World War One historians alike. This is a story far more people should know about, and indeed, this fine book would make the basis for a good documentary on the subject. 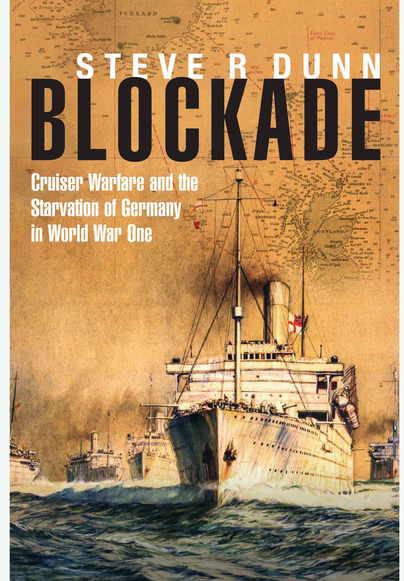 The author has successfully documented a notable yet overlooked achievement in the use of sea control, which prior to the Somme, had already brought about food shortages and civilian unrest.
. . . Blockade provides a readable history of World War One cruiser (AMC) engagements and their use in the Northern Patrol enforcing the distant blockade against Germany. It explains the background to the blockade and why and how it affected Germany. It emphasises the essential reserve supplementation of permanent navy personnel which was critical to naval operations in both world wars. This was a niche but highly successful war fought by a motley of ships and people under appalling difficulties of weather and in conditions of perpetual danger, away from the relative glamour of the Grand Fleet. What it was really like is well told via worked examples. It deserves the recognition that this book gives it. Steve Dunn is an author with a special interest in the Royal Navy of the late nineteenth century and the First World War. He has written biographies and narrative histories, most recently Blockade, Securing the Narrow Sea and Bayly’s War, all published by Seaforth. Steve lives in Worcestershire and southwest France.